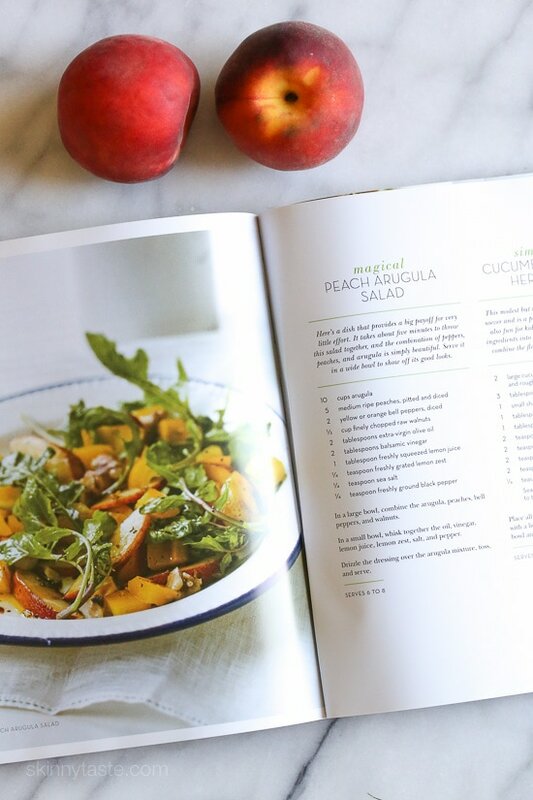 Peaches are so ripe and juicy right now, the perfect time to make this easy, delicious salad you can whip up in minutes! Topped with yellow bell peppers, walnuts and a simple balsamic vinaigrette. I’ve been waiting months to make this delicious salad from my friend Amie’s cookbook, Eating Clean. I finally got my hands on some beautiful ripe peaches from Frog Hollow Farms and set out to make this salad. Amie has struggled with chronic pain and multiple ailments including Lyme Disease for as long as I know her. She’s been healing her body with clean eating to help fight the inflammation and created this book to help others dealing with similar issues. If you’re looking for a food detox and you’re not sure how to start, this book is for you. Even if you don’t have health issues, this salad is healthy, fresh and delicious, run out and make it now! 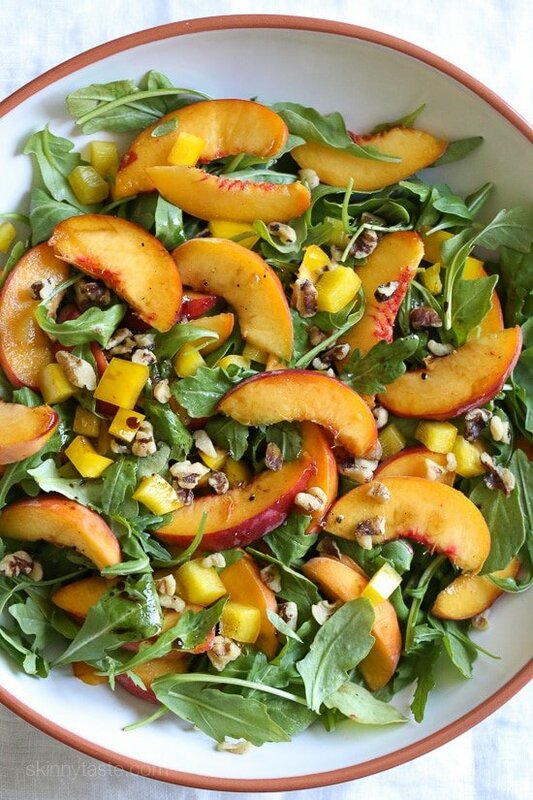 Peaches are so ripe and juicy right now, the perfect time to make this easy, delicious salad you can whip up in minutes! 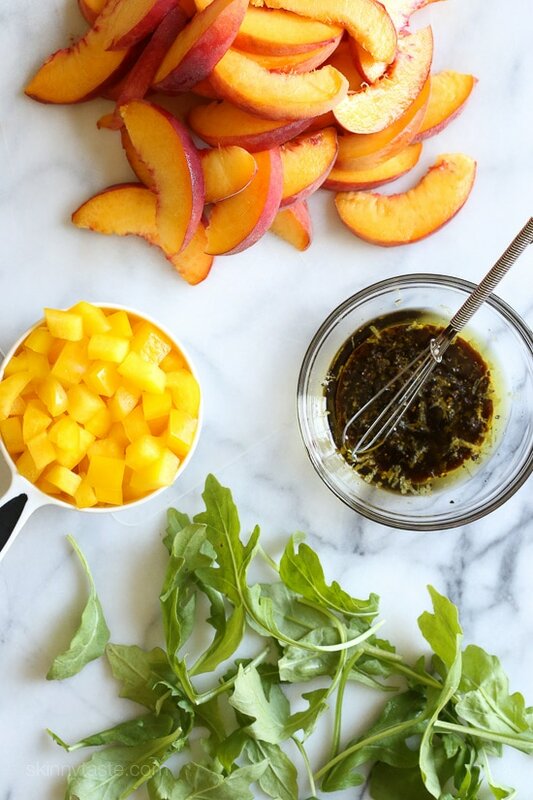 Place the arugula in a large bowl, top with peaches, yellow pepper and walnuts. In a small bowl whisk the olive oil with the balsamic, lemon juice, salt and pepper and drizzle over the salad. Slightly adapted from the Eating Clean Cookbook. I LOVE peaches in salad, but I never thought of pairing them with yellow bell peppers. Thanks for sharing! What would you recommend as a swap for someone with a nut allergy? I sometimes use sunflower seeds but they don’t quite seem to fit the bill in this case. Thanks! What to do with the lemon zest? I don’t see it in the recipe! Love your recipes! I tried this recipe last night and it was OK, everyone ate it by no rave reviews either. I think part of the problem was that the peaches I’d bought were a bit off texture, not sure I’d make again. The peaches make the salad so if they aren’t sweet and juicy, I can see how that would happen. Yum! I made a variation using watercress and nectarines. Red pepper instead of yellow for color contrast and cucumbers for crunch. It was fabulous! Yum! I’m making a variation using watercress and nectarines. Red pepper instead of yellow for color contrast and cucumbers for crunch. This is the first recepe i’ve tried from your website and, i must confess, i was skeptical about the combination, but… I am a believer now 🙂 it all works so well together, it’s absolutly delicious! Mmmmm! Will be making this for this week!